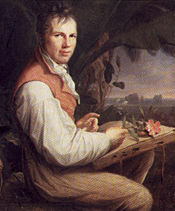 Alexander von Humboldt was a natural historian, geographer and explorer who was the first European to travel widely in Central and South America with the intention of describing the flora and fauna of this hitherto unrecorded region. He was also the first geographer to notice the obvious similarity between the eastern coastline of South America and the western coastline of Africa, thus suggesting the theory of plate tectonics for which he was widely ridiculed until the twentieth century. Humboldt was a remarkable polymath, known for his careful observations and discoveries relating to subjects as wide ranging as chemistry, mineralogy, forestry, astronomy, oceanography and global magnetism. He appropriately entitled his most well read and widely-known work The Cosmos (five volumes, 1845-62). His traveling companion in South America was Aimé Bonpland, a botanist who described over 6,000 new plants on their journey; they collected a total of 60,000. Humboldt returned home by way of the United States, where he met Thomas Jefferson, also well known by then as a natural scientist, and was elected a member of the American Philosophical Society in Philadelphia. His final voyage was a journey to the Russian regions of Asia and Siberia, commissioned by Czar Nicholas I. Charles Darwin referred to him often in the Voyage of the Beagle (1839), an account of the voyage to South America and the Galápagos Islands on which Darwin first developed his theory of evolution. Edgar Allan Poe dedicated Eureka; A Prose Poem (1848) to Humboldt, since the strange work’s cosmology, including a version of the “Big Bang” theory of the origin of the universe, was inspired partly by Humboldt’s remarkable travels and discoveries.